Ava is a professional walker! As soon as we moved in she started taking off walking. She doesn't even want to crawl any more. She was really sick in the beginning of December. She had croup and bronchiolitis. It was so sad to see her suffer. Since she is such a good walker here's a good story for you...when I was over at my mom's house, I was cutting my brother's hair and so she took her down stairs to keep her our of the hair on the floor and to keep her from hanging all over me. After I was done with the hair cut, I started sweeping and I heard screaming coming from down stairs. So I run down to see what happened. My mom was holding her and said "she touched the fire place and burned her hands". I saw these huge blisters on the palms of her hands and my mom said to call the doctor because they look pretty bad. We go the doctor's office and they make us wait for about 30 minutes before one of the nurses comes in to give her medicine. Then about 15 minutes later he comes in. She was screaming the whole time! I felt so bad. He said that they look pretty bad and he wanted me to come in on Monday (this was Friday at the time) and cut off the dead skin. So he bandaged her up and sent us on our way. He said that it looked like 2nd degree but he wouldn't know until he saw the skin underneath. The next week we go in and he cuts off the dead skin and he cried the whole time. It was so sad. He said that if she touched the fireplace a second longer than it would have been 3rd degree. We were so relieved that it wasn't worse than that. We have to change her bandages every day, and she still hates it. She cries and whines the whole time. I feel bad every time that I have to change them. Here is a picture of her below, you can see her bandaged hands. You can't tell in the picture, but her right hand has her 4 fingers sticking out. They weren't burned as bad and so they healed super fast. That has helped out tremendously with her every activities of getting into everything. She can actually grab things and use her fingers. Her left hand was much worse than the right and so it's still bandaged up. 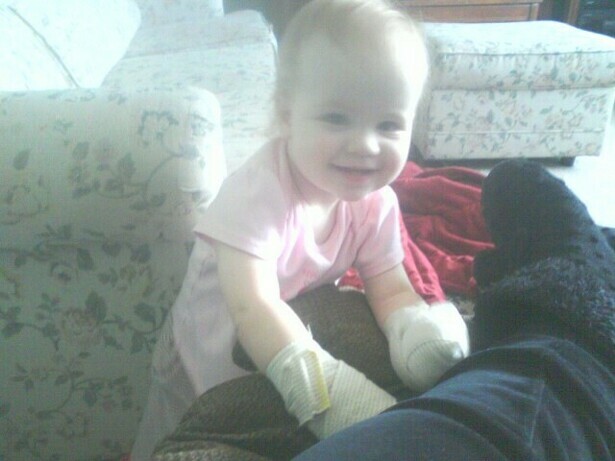 We go the doctor again tomorrow for Ava's 12 month appt and so we are hoping that one of her bandages will be taken off and that her fingers on her left hand will be able to come out. Can you believe that she is a year old? I can't believe it! She has grown up so much! She is having a party tomorrow and I will definately post some pictures of that.